The ‘Internet of Things’ continues to fuel demand. To capitalize on this vast potential, customers will need a supplier who can do more than simply sell them hardware; they will need a partner who can also supply a complete package of services. 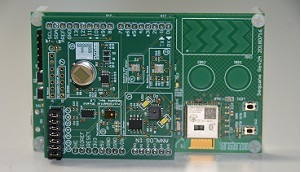 The Nebula board, demonstrated by Thorsten Mohrberg utilises an STMicroelectronics processor with a Murata Wi-Fi Bluetooth module and Cypress silicone to help get your Wi-Fi and Bluetooth applications running quickly and easily. Nebula is an IoT Development kit which offers drag and drop codes for your solution and can be used as an entry point for your reference designs. At Electronica 2018, Future Electronics announced the release of the GaNdalf board. Edwin Kluter, from our Power Vertical Segment explains GaNdalf: a 1kW Power Factor Corrected Power Supply which uses GaN (Gallium Nitride) transistors and is completely digitally controlled which allows 99%+ efficiency! We met with Cesar Martin Perez who explained how Microchip’s building automation via Power over Ethernet technology can . Using one cable to power the lighting system and carry the internet protocol gives increased security , as it’s a one cable network, and also reduce the total system cost. Microchip are helping their clients in 3 main areas: Smart, Connect and Security. We met with ON Semiconductor for a tour of their Electronica booth and spoke to Martin Embacher, technical director of ON Semiconductor who showed us their latest developments in Energy Harvesting, Near Field Communication and the Mercedes-Benz EQ Formula E Team car they are sponsoring in 2019. ON Semiconductor’s technology is utilized in the energy recovery (ERS) pack that controls ignition and injection drivers of the Mercedes-AMG Petronas Motorsport race car, which has won four consecutive Formula One World Constructors’ championships and five consecutive Drivers’ titles. We spoke to Jack Ogawa of Cypress and Rolf Noteboom from Onethinx and discussed the latest developments with LoRaWan and the PSoC6 and see how these new developments can boost IoT Security. During electronica we met with Justin Mortimer of NXP and spoke about the announcement of the new LPC5500, based on Arm Cortex M33, which has full release at Embedded World in February 2019. It has the most advanced security in the NXP MCU portfolio and is by far their most power and performance efficient MCU to market. The M33 is expected to deliver a 20% better performance efficiency over the M4 and also is a greater platform for advanced security. The Centre of Excellence is the design centre of Future Electronics in EMEA. It is designed to help our customers with hardware and software designs, utilising the latest capabilities from our suppliers to provide fully integrated solutions. We spoke to Giusy Tomarchio of the System Lab who took us through the ST Microelectronics Condition Monitoring and Predictive Maintenance demo. Using ST technology, you can monitor all the motors in your factory, connected either wired or wirelessly, and detect the condition and vibration of your motors thus monitor performance. This means you receive the right signal at the right time telling you where maintenance is needed. This will increase your machine throughput, reduce costs and enable you to anticipate maintenance and schedule it at the optimum time. We spoke to Richard Dines and received an overview of the ‘Smaller, Faster and Better’ Panasonic Industrial offering. Miniaturisation is a key feature of the products which will help with board space additionally Panasonic has a wide range of MLCC products that are on a shorter lead-time so you can beat the waiting times. Panasonic offers extremely efficient passive components which enable you to save cost, reduce part count as well as space on your board designs.